This Vegetable Hotchpotch Soup is super easy to make and delicious. We are definitely entering the winter season. During winter the Earth’s energy draws back on itself. Our days and nights are getting shorter and it’s getting colder outside. This is the time of the year we turn inward and our energy slows down. I have noticed that my body’s energy has changed. My body is enjoying taking it slower, being still, turning inward, and is craving warm vegetable soups and stews. There’s something deeply nourishing about a bowl of soup on a cold winter day. I literally feel my body warm up from inside out. Last week I came home with a big bag full of seasonal root veggies. There’s something deeply satisfying in the the earthy sweet flavor of root vegetables.I believe that eating with the seasons naturally supports us to cope with the seasons. In winter we need warming grounding foods to cope with the cold, wet and heavy climate. Eating warm wholesome foods helps to fight common imbalances that are related to to the heavy winter season, such as common colds, coughs, decreased circulation and lack of energy. My new favorite soup is a vegetable hotchpotch soup which is based on Dutch hotchpotch but then turned into a soup. 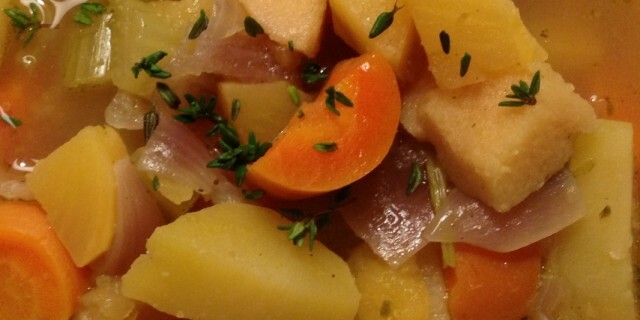 Hotchpotch is basically a stew that Dutch people traditiionally eat in winter time. It typically contains potatos, onions and winter vegetables like carrot, endive, spouts or kale. It’s heavy, hearty, wholesome food. This recipe is a bit lighter as I made it into a soup. It has a delicious natural sweet flavor and warms your body from inside out. There’s something about slow cooking that brings out the sweetness and deep natural flavor of the vegetables. You can add any kind of vegetable to this vegetable hotchpotch soup you like, like Brussel sprouts or kale.